On the occasion that I receive media coverage, I will post it here. February 12, 2007; Did television interview for TV3 out of Winchester, regarding the Animal Shelter mural. TV3 is a new local news station soon to be airing in Winchester, VA starting sometime around March 5th, 2007. I have no way of seeing it, and cannot ensure that the story will even air, but the reporter that interviewed me assured me it would air, sometime in March. So if you get TV3 and see the story, let me know how it went! This is my first article in the newspaper, and I would like to thank Val Van Meter and Rick Foster for all their hard work, resulting in this wonderful article! Thank you so much!!! WINCHESTER — Gretchen, the Doberman pinscher who for years was the mascot of the Esther Boyd-Frederick County Animal Shelter, now guards a door at the new building that will house the county’s lost and abandoned pets. The structure, adjacent to the Regional Jail, will open once all the animals are transferred from the current shelter at the Regional Landfill. The projected opening date is Jan. 29. Muralist Michele D. Sommers has painted Gretchen’s likeness beside the reception counter in the new lobby. On the wall behind the counter, the shelter’s current mascot Henry will keep an eye on everything. Gretchen and Henry aren’t the only beloved pets which will enliven the lobby walls at the new shelter. Also depicted is a tortoise-shell cat adopted by the late county supervisor Harrington Smith, one of the founders of the current shelter. It has a place of honor on one of the walls above a plaque dedicated to him. But for December’s dedication ceremony, Henry and Gretchen represented them all. Sommers, a Front Royal resident who spent 17 years working as a veterinarian’s assistant, said she can’t volunteer at the shelter. She has three dogs at home, two of them rescued animals, along with six cats, two horses, three birds, and some fish. Strawsnyder was familiar with Sommers’ pet portraits. He has one, a Christmas gift from his daughter Lori. The shelter’s lobby walls now feature green-leafed trees and the rolling green of the Shenandoah Valley’s uplands. A portrait of the late mascot Gretchen adorns one of the walls at the new shelter. “I tried to keep the color really soothing. I want people to feel good,” Sommers said. She worked from photographs of two of these animals, but she’s used to that. Many of her commissions are for pets which have died. Sometimes, as when she did a portrait for a man in New Jersey, photographs are all she has to work with, even of living pets. That painting was a challenge, since the owner wanted Sommers to re-create a rather famous picture — of dogs seated around a table playing cards — but he wanted his own five dogs represented. And, she recalled, the pictures he sent showed the dogs full-face, but in the painting, all the dogs are in profile. “You have to work closely with people to get it right,” she said. In addition to her pet portraits, over the past decade she has created a wide variety of murals for businesses and private individuals in the area. The Animal Medical Center in Stephens City has underwater scenes on three lobby walls. For a little girl’s bedroom, she painted a plethora of fairy-tale princesses. For a young boy, a forest includes sporty green frogs. An employee of the Smithsonian Institution’s Conservation and Research Center in Front Royal asked Sommers, who has also worked there, to put some of the exotic animals from the center, such as the clouded leopard, on the walls of his daughter’s bedroom. Sommers worried that one, a 2-foot-tall bear, might frighten the child, but no. The man said his daughter pats it on the head each night before she goes to bed. Sommers has also been commissioned to put murals in unusual places. A homeowner in Middletown has one of her paintings on dual garage doors. The scene features a rural road with a raccoon checking out the approaching cars and a fox leaping over a stone wall. Sommers does her murals in an acrylic paint, which she found in California. It is suitable for both indoor and outdoor work. Rough concrete block isn’t the most accommodating surface for paint, she noted. She likes the quick-drying feature of acrylics, but has recently branched out into oils and is doing human portraits, too. For more information, call or visit www.sommersendoriginals.com. As part of his Eagle Scout requirements, Brendan Oudekerk, 17, built a 12-by-12 foot storage shed for the Round Hill Ruritan Club. The shed now sits at the back of the Ruritan Club’s meeting facility off U.S. 50 West, but one of the advantages of his design is that the shed is portable. 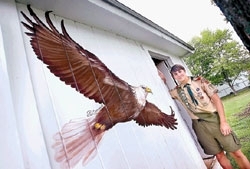 Since he had some money left over from his project, Brendan enlisted the help of artist Michele Sommers, who painted a bald eagle in flight on the front the shed. A senior at James Wood High School, Brendan is a member of Troop 10, which meets at the Round Hill Ruritan Club. He is the son of John and Nancy Oudekerk of Frederick County. Boyce — The French Impressionists painted some of the art world’s most enduring images in the open air. Painting en plein air still holds an aura of whimsy — but the Blandy Sketch Group at the State Arboretum of Virginia admits that it’s not always as romantic as it sounds. "There are a lot of distractions like bugs and birds," said group member Julie Read of Winchester. "In the studio, you have everything at your fingertips." The artist who doesn’t mind lugging sketch materials or paints and canvas to the perfect vantage point just might find inspiration, she said — even if it means contending with a few insects, sun, and the occasional wind gust. Pam Forbes of Bluemont, curator for the art show given by the Blandy Sketch Group, hangs "Night Owl," a mixed media piece by Linda Bowman. "You have to edit a lot of extraneous objects. You’re tempted by all the wonderful things nature provides," she said. "It’s hard, but it’s a wonderful way to learn composition." Read’s composition, "Fall Sycamores," is gracing many of the publicity postcards for the Blandy Sketch Group’s sixth annual Fall Art Show. The exhibit featuring works from 11 sketch group members will be open to the public daily from 10 a.m. to 4 p.m. Friday through Nov. 1 in the Quarters dining room. The opening reception is scheduled from 2 to 5 p.m. Sunday with light refreshments and a chance to meet the artists. The sycamore composition wasn’t created at the arboretum, Read said, but it still sticks with the show’s basic theme of nature. "I just love trees. I enjoy the shapes and the twisting and turning of trees," she said of her inspiration behind the sycamore piece. Read’s work is among about 30 art creations, developed in a variety of mediums from acrylics to a linoleum block print. Only photography will be excluded. "It’s a culmination," said curator and group member Pam Forbes of Bluemont. "There’s a lot of variety in style." Artists with skill levels ranging from beginner to professional could exhibit three large pieces or five smaller ones, she said. Hanging art at the State Arboretum of Virginia for the Blandy Sketch Group Fall Art Show, opening Friday, are (from left) Pam Forbes, curator at Blandy; Linda Bowman, assistant curator, and Barbara Alderman, president of the group. The show continues through Nov. 1. "It should be a really nice fall show. Some of the works will be from Blandy," said Tim Farmer, spokesman for the arboretum at Blandy Experimental Farm in Clarke County on U.S. 50, east of Winchester. Artists are always welcome to sketch or paint at the arboretum, he said. Their subjects could include a closeup of plants, a mushroom, wild flowers, or the Blandy breezeway, he added. "The Blandy Sketch Group has become quite an active group. They’ve contributed a lot to Blandy." The art reception and all viewing opportunities are free of charge, he said, but most of the paintings are available for purchase. Thirty percent of the proceeds will benefit the Foundation of the State Arboretum. "It should be a good show. We have several new artists," said group President Barbara Alderman of Winchester. Featured artists include Alderman, Forbes, and Read, as well as Dale Ball of Lovettsville, Linda Bowman of Leesburg, Karen Coleman of Round Hill, Anthony Coviello of Bluemont, Rosemary Inoue of Berryville, Geraldine Kiefer of Winchester, Rita King of Berryville, and Michele Sommers of Front Royal. "Karen Coleman is one of the best botanical artists we have in the Valley," said Alderman. In addition, Sommers is responsible for the detailed mural in the Frederick County Esther L. Boyd Animal Shelter, she said. The sketch group was established in 2000, and it gathers monthly to work on new techniques. Dues are $5 per year. Call 837-1758 for more information. On the sidewalk downtown in front of the gift shop, Delilah's, artist Kelly Walker cautions several onlookers to step back as she swirls her brush in a container of acrylic paint. She raises the brush above her head and brings it down quickly; spattering white paint over the abstract work she's taped to the table. "That looks like fun," comments a passerby. "It is fun," Walker says, "Don't you want to do this?" Walker raises the brush again. "I'm channeling Jackson Pollock," she quips. Walker is out on the sidewalk on a hot summer evening as part of the "Third Thursday Art Walk," an event designed to bring downtown merchants and local artists together in an effort to make art more accessible to the community. Walker said she'd been to art walks in other places and that she and Blue Ridge Arts Council executive director Kym Crump had talked about it for a long time. "It just seemed like the time was right," Walker explained. "Changes opened up and started showing art, the Listhus Gallery opened and, of course, the Lucky Star Lounge has art." There is also art in Gourmet Delights down the street, where, inside, local artist Michelle Sommers is working. Sommers said she doesn't mind having eyes over her shoulder as she works. "I do murals, too, so it's pretty normal for me to have people watch," Sommers said. "It bothered me in the beginning, but I'm an old pro now." Sommers got started in the mural business when she donated one to the Frederick County Animal Shelter a couple of years ago. "That really started the ball rolling for me," Sommers said. Sommers said she likes the idea of the art walk. "I think it's important for the community," Sommers said. "I think we need to see a lot more of the artists around here." Arena, who has a few of Sommer's pieces for sale in her shop, agreed. "There's a lot of talent in Front Royal and Warren County and this is one way of having people come out and appreciate it," Arena said. Sommers said she'd like to see more artists from the community get together for their own sake. "I don't personally get to meet many local artists," she said. A little later, at 7 p.m., a poetry reading kicked off with Heather Davis inside The Daily Grind. "Restless in the Blue Ridge," featured Davis and local poets Jose Padua and Kristin Camitta Zimet. "Poetry is art, too," Crump said. Listhus Gallery had sand paintings on display, as well as a demonstration on creating hand-spun yarn. As many as 15 downtown businesses participated in the art walk, including the Soul Mountain Cafe, the Wine and Duck, Weasel Creek Outfitters, Hands to Create, D&B Chocolates, Ole Timer's Antiques, Ridgeline Designs, and Vino E Formaggio, the new wine and cheese shop that opened last week. Many of the merchants had something special going on or offered discounts. The next art walk is scheduled for Thursday, Aug. 21, from 5-8 p.m. on Main Street. Michele Sommers (left) and Stephanie Harding painted a mural in one of the rooms at the Blue Ridge Wildlife Center in Clarke County. The scenes in the mural represent the area around the center, which is near the Shenandoah River. Millwood— The indoors and the outdoors have come together in four walls at the Blue Ridge Wildlife Center, 930 Tilthammer Mill Road, Millwood. Front Royal artists Stephanie Harding and Michele Sommers have created a mural in the center’s reception/exam room, depicting one of the four seasons on each wall, said Belinda Burwell, center director. A pair of raccoons peer out of a tree stump in the mural of the wildlife center. The images include those of the animals that the center sees, and replicates the scenery around it. It’s almost like looking through a window, Burwell said. The color opens up the space in the center’s building, which is located in a home from the early 1800s, with low ceilings and plaster walls. Sommers has a lot of admiration for the people who work many hours at the center for not much money. The mural idea came about last summer, Burwell said, when Harding and her sons volunteered at the center every Saturday. Burwell mentioned the room needed paint, Harding said, so as an artist, she offered to help paint it, and Burwell suggested a mural. Harding of Bryarpatch Artistry enlisted the help of her friend Sommers of Sommers End Originals. Aside from being an artist, Sommers is also a former veterinary assistant of 17 years who had previously donated a mural to the Frederick County Esther Boyd Animal Shelter. Both women are also longtime animal lovers. They’ve worked together and separately on the mural, and both said they still have some animals to add to it. The center, which opened in 2004, is a nonprofit organization that cares for 1,500 animals a year, Burwell said. It assists injured, orphaned, sick, and displaced native wildlife in Clarke, Frederick, Warren, Shenandoah, Fauquier and Loudoun counties and is completely dependent on private donations. Belinda Burwell holds Briar Rose, a hawk that was rescued by the Blue Ridge Wildlife Center and brought back from a coma it suffered from West Nile virus. The bird is included in the mural in the background. The artists donated the mural to the center, Burwell noted. It’s currently in its busiest time of year. Lots of orphaned baby animals end up at the center from May to August, she said. In some spring/summer months, it can see from 300 to 400 animals. “It’s been a struggle,” to keep afloat, Burwell said, with the hungry mouths coming faster than the donations. Still, she said the community — including people like Sommers and Harding — has been very supportive of what the center does.